I had thought of myself as quite an open kind of person, but now I was beginning to wonder if I could make more satisfying relationships with people, and particularly with men. I realised I presented a certain persona of competence to the world, so if anyone asked ‘how are you?’ I would say fine, or not bad etc., but I wouldn’t really go into how I was. And I wasn’t really truthful with myself about my own emotional ups and downs. I later joined a men’s group in Leeds and found a bunch of people who were all for different reasons wanting to find out about themselves. 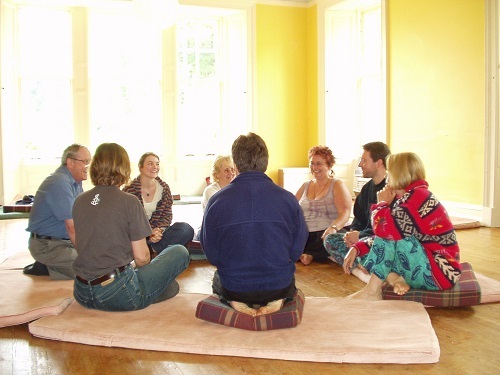 We ran the group as a kind of self-help, DIY therapy group for a while, but, as is common for groups that focus on the self and relationships, we ran into some difficult conflicts and decided in the end to call in a therapist to help us sort through what was going on in the group. The group continued to have both difficulties and rich opportunities for personal growth, and I stayed in it for about 8 years in total. I also became interested in assertiveness training. In my 20’s I had thought of myself as a fairly confident person, but then I saw a TV programme on Channel 4, with Anne Dickson and Andrew Sachs, called ‘Assert yourself!’ It really made me think about how I would stop myself from putting my point across to people, or else how I might get into blaming the world for my problems, instead of taking responsibility for my development. The assertiveness training course that I subsequently did focused on ways of behaving, and was very useful to me. But I started to wonder about what was going on underneath or behind my behaviour – why do I do what I do? What are the feelings that inform my choices? What about sadness, joy, disappointment, ambition, anger, jealousy, envy? And, how do my feelings and internal workings help me or hinder me when I have to deal with challenging issues like relationships, career change, family changes and health questions? Round about the same time, I got into co-counselling. What I got most from co-counselling was a sense of freedom to be myself – I felt I had permission to explore inside myself without being disapproved of if I found something unpleasant…it’s been really liberating. I have also become more accepting of others. These things – the men’s group, assertiveness training, co-counselling – started to help me find out the truth about myself and be more in command of my own life. When I started to train professionally as a therapist I began seeing a therapist myself, first in individual therapy, and later in group therapy for six years. I have worked with four or five different therapists over the years.